Waiouru: A Wey we go! 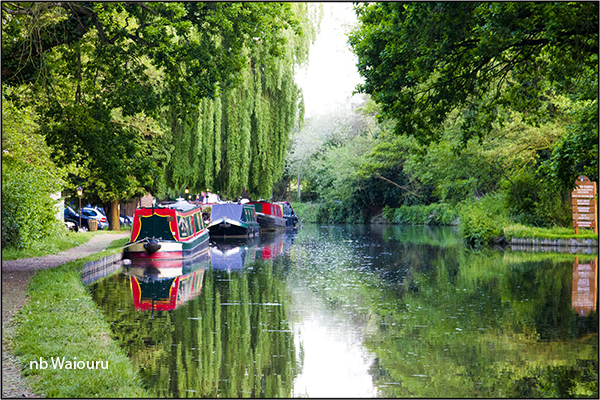 Our one week license for the Wey was due to expire so it was time to move after two quiet nights beside The Anchor pub. It was a moderately early start to the day because we knew from our journey up the Wey that today’s section was going to be shallow. These moorings outside The Anchor are good…. If you can find a vacant space. 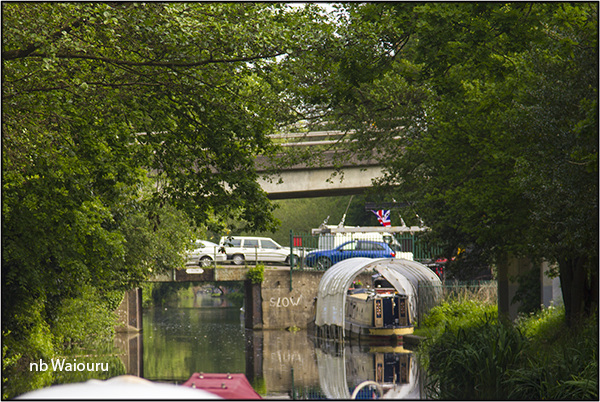 We slowly cruised down the Wey reaching Parvis Bridge where there is a boatyard on the southern side. 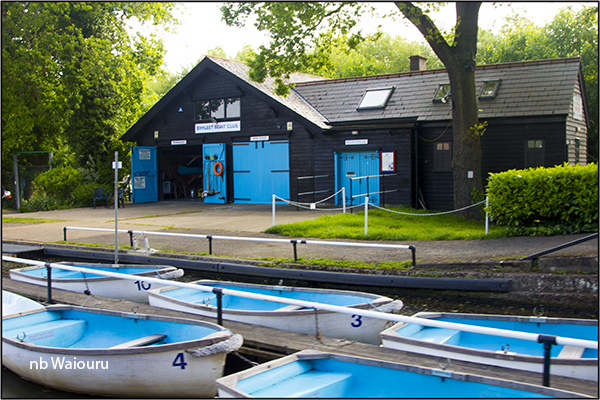 On the northern side is Byfleet Boat Club and hire base. Woodham Junction is only a short distance and the Basingstoke Canal branches off here. After looking at the map we realised it’s actually longer than the Wey. However a couple of the local boaters told us that since its management was taken over by Basingstoke and Hampshire Council’s little dredging has been done and consequentially it’s very shallow. Apparently it is very picturesque and rural once you pass Woking. 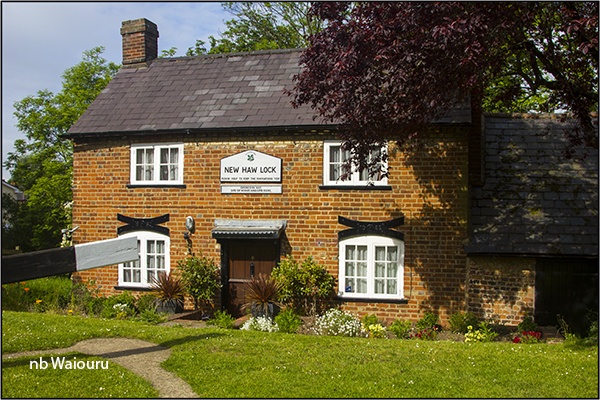 The cottage at New Haw Lock looks lovely. But the downstream gates are very heavy. Probably because the road bridge is so close to the lock that the gate beams now have a dogleg in them. 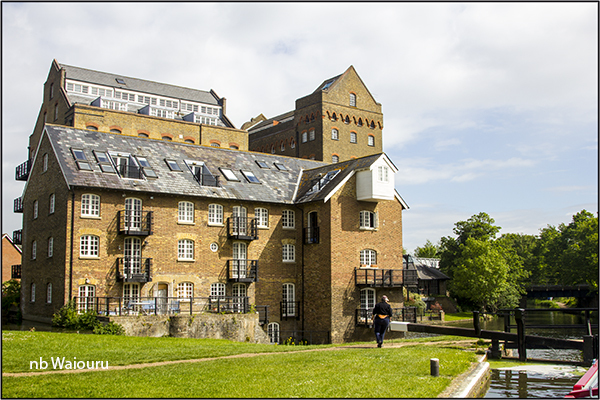 Another photo of Coxes Mill as we wait for Coxes Lock to empty. It’s the deepest unmanned lock on the Wey Navigation. 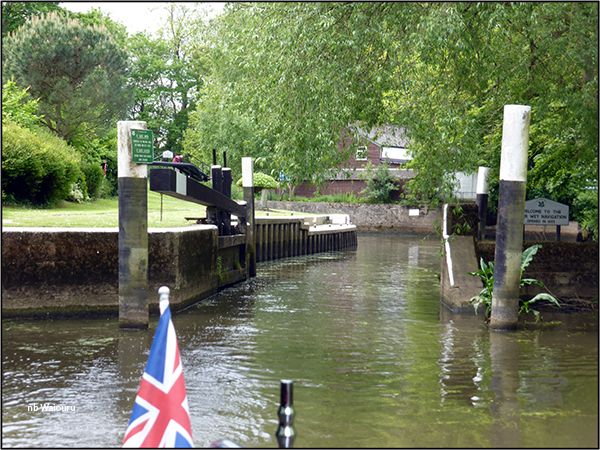 The lock keeper worked us down Thames Lock which is the last (or first) on the Navigation. Apparently the lock keeper has to work the lock because this is the only lock where the National Trust has retained the original paddle mechanism. The safety latch on the gear mechanism is a small steel wedge on a chain that has to be inserted into the teeth. After we had dropped down through the lock we stopped to fill the water tank before exiting onto the Thames via the stop gate. The stop gate has to be closed and a full lock of water let out of Thames Lock to raise the water level sufficiently for boats to clear the lock cill. Dinner tonight was wild boar & apple sausages with roast root vegetables, courgettes covered with Australian gravy. Isn't it strange that we kiwis don't contest the ownership of Australian gravy? I am surprised that Ray and Diane haven't challenged you about it, Tom. I do enjoy your blog - it is full of very useful information. We are on our way southwards now, aiming for London, but at a slow pace - easing ourselves in gently to this physical life! Marilyn, They can keep the gravy and Russell Crowe provided we keep pavlova.